Belfast has not an any point in the last century experienced a night remotely as disastrous or traumatic as the worst of the three nights of the 1941 Belfast blitz. Almost 1,000 people were killed overnight on Easter Tuesday, the worst single night death toll anywhere in the UK outside of London from Nazi bombs. Men and women and children, Catholics and Protestants and neither, were slaughtered. Many of them had agonising deaths from fire cause by the high explosives. Even the later May 1941 raid, one of four German raids on Belfast within weeks, led to 150 deaths. 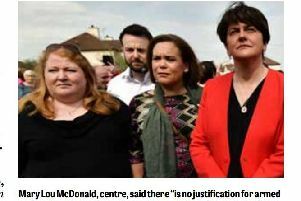 To put that in perspective, the single worst atrocity of the Troubles, the Omagh bomb, led to 29 people being murdered. The barbarous Bloody Friday massacre by the IRA in Belfast in July 1972 left nine people dead. But the blitz death toll dwarfed such figures. The 150 dead from the May 1941 raid on Belfast was more than died in any one year of all but six years of the 30-year Troubles. Northern Ireland’s capital city had not been prepared for the horror because few people thought that the Germans would be able to fly to far and back. It is very much to be hoped that Belfast never experiences devastation on even a fraction of the scale that it did back in 1941. It is hard to envisage a scenario in which a comparable attack would happen. But we should not let this momentous and shocking event, the Belfast blitz fade, into barely known history. The Belfast Ulster Unionist councillor Jeff Dudgeon is very much to be congratulated for his effort to get a permanent memorial to the victims. That should be in Belfast City Hall. And it should not be tied to a provocative Sinn Fein bid to have a republican statue placed in the grounds.